EFL = Telescope focal length/Eyepiece focal length x DF (the distance from the center of the eyepiece to the film). The Deluxe Tele-Extender is used for high-power lunar, solar and planetary photography as well as for extreme terrestrial photography. It fits over the telescope’s eyepiece (even large eyepieces such as those in Celestron’s Ultima line), and connects to the visual back of the telescope. Optional counterweights will be necessary to properly balance the telescope when using the Tele-Extender. To use the Deluxe Tele-Extender, remove the diagonal from your telescope and insert an eyepiece directly into the visual back. Place the Tele-Extender over both the eyepiece and the visual back, then attach your 35mm SLR camera to the back of the Tele-Extender, using a T-Ring. The Tele-Extender’s built-in safety device will help prevent your eyepiece from becoming accidentally dislodged. There are a few things to keep in mind when using this accessory. First, the image you’ll see through your camera’s viewfinder will be upside-down. Secondly, due to the extremely high magnifying effect afforded by this accessory, extra care to prevent camera and telescope vibration, accurate polar alignment and use under good seeing conditions will all assist you in capturing high quality images. 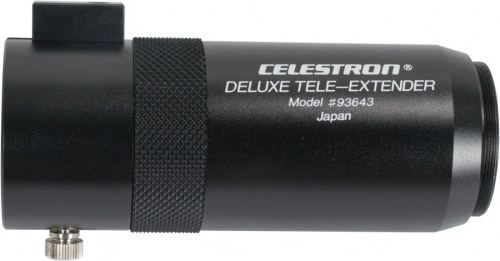 Celestron T Adaptor EdgeHD 8"